Last year Ned Wieland became the youngest Australian male to swim the English Channel and this year earned the ‘Triple Crown’ of open water swimming by completing the Catalina Channel and the 20 Bridges Swim around Manhattan – all with the power of prayer. The 17-year-old has raised close to $44,000 for suicide prevention charity R U OK through his Everyday Hero fundraising page. 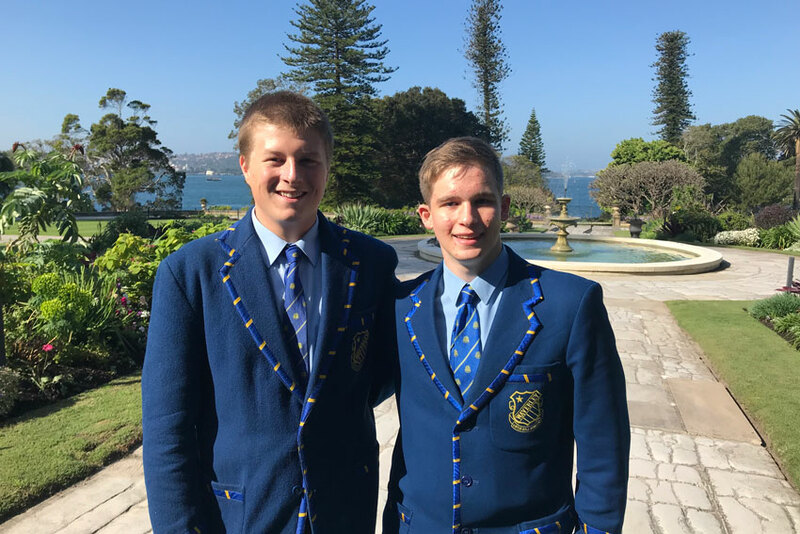 Ned and fellow student at Waverley College, Thomas Carey, were recognised for their incredible community contributions at the 2018 John Lincoln Youth Community Service Awards held at NSW Government House recently. The awards, given by the Order of Australia Association (NSW), were presented by the Governor of NSW David Hurley and Mrs Linda Hurley. Thomas, 17, raised more than $16,000 through the Leukaemia Foundation’s World’s Greatest Shave two years ago, following through on a promise he made to his twin sister, Elisabeth, who died of the disease. And he convinced 20 of his school mates to do the same. Both young men said they felt honoured and humbled to receive their awards. “It was an incredible moment that I will never forget,” said Thomas. “I felt very honoured and proud to be amongst other young people who have gone to great lengths to help others. “In my life, I have been on the receiving end of support and kindness in many forms – particularly when my sister was fighting leukaemia and passed away. Ned, a swimmer from the age of 1, said that it was after the unexpected death of a good friend Hussain Gholani to suicide at the age of 19 that he became more aware of R U OK day and chose it for his fundraising efforts. “I’ve been given this gift so I may as well use it to look after others,” he said. He said that prayer has been a great help to him in all of his long ocean swims, “whether by helping me take one stroke after another, or by clearing the weather up to allow me to continue”. Graham Leddie, Waverley College’s Head of School, who nominated the boys for the award said they had acted far beyond their years, “selflessly raising money for others while experiencing some of the hardest times they will have to face”. “They have demonstrated notable dedication, compassion, and generosity in the way they have used their abilities and energy to benefit others. Marilyn Rodrigues is a multimedia journalist at The Catholic Weekly. She also blogs about faith, work and family at marilynrodrigues.com.